On February 6, 2019 over 50 attendees gathered at the Union League Club to listen and learn from five accomplished panelists. Elaine Brennan (Roosevelt & Cross Inc.), Kaitlin Briscoe (Spring Lake Asset Management), Cynthia Clemson (Eaton Vance), Zoya Gargiulo (Mohanty Gargiulo LLC) and Christiane Olsen (UBS Financial Services Inc.) shared incredible stories from their experiences in the Muni Bond business. There was ample time for conversation with the panelists and networking with other attendees. We were fully subscribed and the positive feedback has been overwhelming! Thanks to all for making this event a huge success! PLG Veterans Assistance Fund Inc. and Remember A VEteran Inc. reprise their annual 'Valentines For Veterans' event at the Brooklyn, VA! Armed with my team of volunteers and many bags/boxes filled with much 'stuff'; the veterans wore smiles from ear-to-ear and embraced this event with full heart and spirit! They were in awe of the 'unconditional love' we demonstrated with free gifts including beautiful handmade cards, lovingly made by MBWC members/guests. Our ample supply of handmade cards were given to each and every veteran who came our way! A big thank you to MBWC for hosting our January card-making event with 23 participants (members/guests) yielding 149 handmade cards! To round out 'Valentine's For Veterans', we had entertainment provided by the very talented singer, Michelle DellaFave, and guitarist, Thayer; just wonderful. The vets enjoyed the music immensely; some even danced with my volunteers! It is so rewarding to bring this to the Brooklyn, VA every year where my late partner, US Army, VIetnam Veteran, Patrick "Pat" Gualtieri, was also a patient until sadly he passed (d. July 21, 2015) from lung cancer that metastasized. He received good care and treatment at the Bklyn, VA. Pat created this event and I am proud to continue the tradition of hosting this in Pat's honor, memory and 'living legacy'... it doesn't get 'old' but 'renews' each year... heartwarming! The MBWC honors and remembers our veterans' community by actively supporting special events such as 'Valentine's For Veterans', by PLG Veterans Assistance Fund Inc. (M. Levi, Founder). On Wednesday, January 16, 2019, approximately 23 (chapter members and invited guests) came together in the offices of Jefferies, where one of our Club officers works. For approximately two hours, the participants made beautiful Valentine cards with creative style and flair! With common purpose of card-making, every moment is geared towards this end goal with the added perk of social engagement and delicious refreshments, and ample card-making supplies; compliments of MBWC! This contagious enthusiasm and camaraderie, shared by new and returning participants, resulted in a phenomenal total of 149 beautiful, hand-made Valentine cards! Lifetime chapter member, Marleen "Molly" (as best known in the veterans community) Levi will then produce PLG Veterans Assistance Fund Inc.'s annual 'Valentines for Veterans' event on Thursday, February 14, 2019 (Valentine's Day) at a local veteran facilities at which time our cards (and other acceptable donations) will be lovingly given to individual veterans! It's a home run! MBWC extends a heartfelt thank you to all who participated, for your time, and creativity! Feedback has been amazing; we're so pleased everyone enjoyed this event - see you next year! It was great to share some time and camaraderie with so many Muni women. The spirit of the holiday season was in full force! We are very proud of our support for Women in Need shelters. WIN went home with a car load of toiletries and proceeds from our raffle. Thank you again to Colleen Meehan for bringing us together with WIN! On December 7, 2018 Colleen Meehan and her Dreyfus elves delivered gifts for 25 children living at the Junius Ave, Brooklyn WIN Shelter. Thanks to all our MBWC participants for their support and generosity. It was a very moving experience for Colleen to drop the gifts off and meet the amazing volunteers and employees of WIN. A big thank you to everyone at Dreyfus who pitch in to help. And a big shout out to Mary Gordon for supplying a hand truck! That was a good story for our Holiday party! On October 10, 2018 MBWCNY members gathered at The House in Gramercy Park to mingle, network and vote for the 2018-2019 slate. On August 16, 2018 MBWCNY members sailed from Battery park on the Clipper City Tall Ship for a sunset tour around NYC harbor. This could be our new annual event! 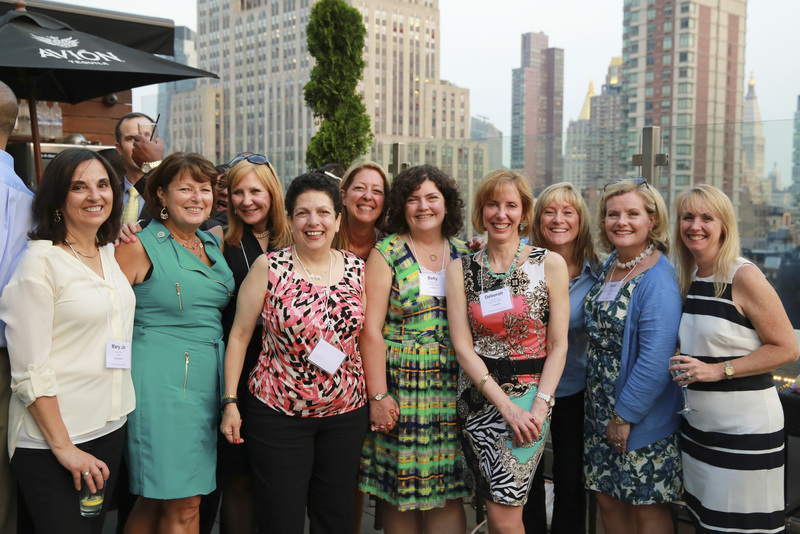 MBWCNY members attended the annual rooftop cocktail party on June 13, 2018 to celebrate the 86th year of the Municipal Bond Club of New York. Our Second Annual Yoga event held on June 27 on the Sheep Meadow in Central Park. Our practice was led by our very own certified yoga instructor, Donna Ciccimarro. The MBWC honors and remembers our veterans' community by actively supporting special events by PLG Veterans Assistance Fund Inc. This year was no exception! On Wednesday, January 24, 2018, approximately 20 chapter members and invited guests came together in the offices of Jefferies, where one of our Club officers works. For 2 hours, the participants made beautiful Valentine cards for our veterans with creative style and flair! With common purpose of card-making, every moment is geared towards this end goal with the added perk of social engagement and delicious refreshments! This year, we reached a record total of 170 beautiful, hand-made Valentine cards! Lifetime chapter member, Marleen "Molly" (as she's known in the veterans community) Levi will host their annual 'Valentines For Veterans' event on Wednesday, February 14, 2018 (Valentine's Day) at local veteran facilities at which time our cards (and other acceptable donations) will be lovingly given to individual veterans! It's a home run! MBWC extends a heartfelt thank you to all who participated, for your time, and creativity! A few words from Susan V. Dushock, previous MBWC President who founded our relationship with Women In Need shelters. It makes me feel so good to know that you all have carried this forward. Wow, from the small gifts we collected at our Holiday parties to this takes my breath away. Please thank all those who have continued their support for me! All my love. Holiday Cocktail Party November 29, 2017- held at The World Bar United Nations Plaza. MBWC members and guests raised $680 during our Holiday celebration which was donated to WIN 'Women In Need' Shelters. This day of 'unconditional love' in the tradition set forth by Pat Gualtieri was proudly sponsored by PLG Veterans Assistance Fund Inc. and Remember A VEteran Inc. [R A V E]. Valentines For Veterans actively remembers our veterans and military including Gold Star family members for their service and sacrifice. Thanks to individual and corporate donors, many beautiful, handmade cards, gifts, goodies, candy, chocolate hearts and sooo much more were made available to give out. Thank you all for your participation and donations ... so rewarding for veterans and volunteers alike! January 18, 2017: Members and guests of the Municipal Bond Women's Club (MBWC) once again gathered together in spacious corporate offices in Manhattan for this coveted, annual event - creating Valentine's cards for our veterans' community! MBWC embraces this event spearheaded by long-time Club member, Marleen "Molly" Levi, Veterans' Advocate and Founder of PLG Veterans Assistance Fund Inc. and Remember A VEteran Inc. [R A V E]. Molly remarks: "There is such a warm, friendly, energized and positive vibe in the conference room, where participants busily focus on card-making for the next 2 1/2 hours". End result this year: 123 beautiful, creative, heartfelt, loving, hand-made cards with messages of i.e., 'Thank You For Serving' and 'Happy Valentine's Day' expressed using an array of arts/crafts supplies, courtesy of the MBWC. Club Member and past President, Betty Infantes along with current President Victoria Lee, provided the working space and assorted refreshments compliments of their employer, Jefferies & Co. Inc. "The women welcome this opportunity to 'give back', say thanks and remember those who proudly served our country", comments Betty. Both new and returning guests thoroughly enjoyed a fun, social and productive evening. The women surprised themselves with their creativity in what they produced! The cards (along with other donations of assorted gifts and goodies) will be distributed at a local VA facility on February 14, 2017 - Valentine's Day by Club Member, Molly (as she's known in the veterans' community). This event is dedicated to Molly's life partner, Patrick (Pat) Gualtieri, a Vietnam veteran and icon in the veterans' community who sadly passed away July 21, 2015 from lung cancer. He is credited with creating this Valentine's event and inspiring others to always remember our veterans and MBWC certainly does! All present and accounted for except Betty Infantes who had to leave early. On January 28, 2016, under Club member Marlene Levi's initiative, about 20 members and guests of the Club gathered once more to prepare Valentines cards for the veterans' community. The participants were energized by the warm and friendly positive vibe that filled the room as we busily worked on 'Thank You For Serving' and 'Happy Valentines Day' cards using an array of arts and crafts supplies, courtesy of the MBWC. Many thanks to our Vice President Betty Infantes, who provided the working space and assorted refreshments compliments of her employer, Jefferies & Co. Inc.. "The women enjoy this opportunity to give back and say thanks to those brave men/women who proudly served our country", remarked Betty. Both new and returning guests thoroughly enjoyed a fun, social and productive evening. The end result: approximately 200 beautiful, creative, hand-made cards of which the women take much pride, surprising themselves at what they produced! Marlene, or "Molly" as she's known in the veterans community, distributed the cards (along with donations of candy, cookies, and other assorted gifts) at a local VA facility in Brooklyn. At the lovely Holiday Party, besides catching up, drinking, eating, raising money for Women in Need, donating gift bags to Women in Need, buying Silpada jewelry to benefit Women in Need, we also heard Marlene "Molly" Levi present this heartfelt Dedication to Eva Hrastnig-Mieras, longtime member, friend, officer, photographer... well the document below (a copy of the official framed Dedication) says it all. We'd love to hear from you. Please contact us at info@mbwcny.com.